Well, it's kinda given that the launcher-based weapons will look terrible, since they're really only for play. Honestly, these are pretty nice from what I can see. Han's the least interesting, but I love the trooper, and Maul intrigues me. It looks like there's some new coverage for the back of his shins. And, as Square pointed out, technic in the upper arms. IMO, the technic looks obtrusive there. EDIT: Maul's lower arms are also custom, which makes me think the arms contribute to knob function, or have their function to them, perhaps since his weapon is double-handed. Everyone has been asking Lego for new feet for years. Lego's response? Slap a G2 add-on on it, which looks dumb, and call it good. Finally got around to making the First Order Executioner. Thought it came out pretty good. These are lego right? Make your own! Mess with pneumatic hoses or something. There's this moccist on flickr called nobu tary that revamped the star wars figures. He just used common lego plates and slopes for the feet and it looks fine. I love me some nobu tary MOCs. That man, or woman, has talent! For all we know they could be an extraterrestrial, a skilled extraterrestrial. Overtime, the box art for the Super Battle Droid and Walker have been clearer, but still no full image of the figure. The SBD does use Hans sholder piece and capable of swapping 2 type of stud-shooters wrist manually. The Walker is pretty tall, however the stability of posing is really bad to think about, I'm also worry this will cost more than the Speeder Bike from last year. Where did you found better images? I don't think that the assortment or arrangement of the firearms on that Super Battle Droid (75538) should be taken as finalized, IMO. @Skycraft I'd try searching "summer lego 2018" on YouTube. I would like to see a Tatooine Luke Skywalker in the future. Maybe a Ben Kenobi too. I would too, but being human, they may not sell well. They could not sell because of the human sculpts but, since it's Episode IV Luke and Ben they're probably iconic enough to sell. I know we have a Luke figure, but I would love to see a Tatooine one, so we could get a head with his original hair style. 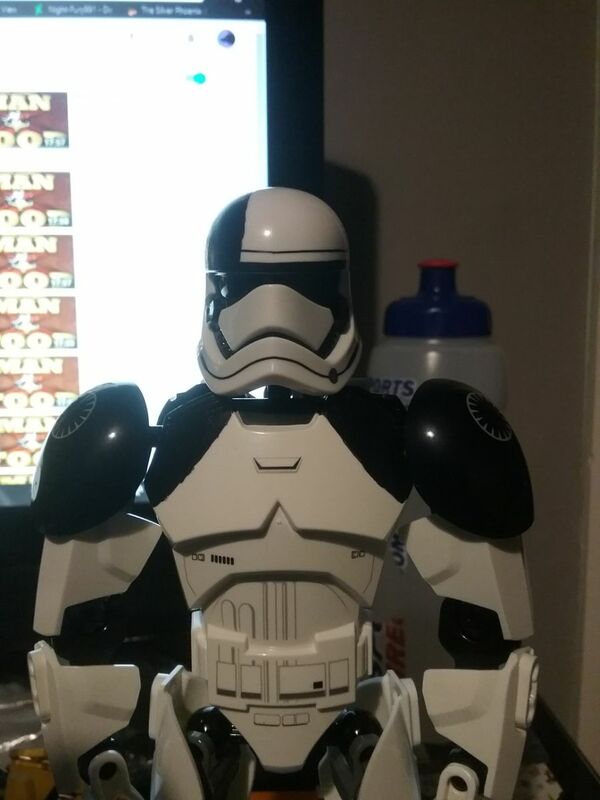 This would be great for remaking the Stormtrooper scene. I am sure that Lego can fix the heads. There are tons of figures out there that have a good head representing humans. I am sure that Lego can do good heads for the Star Wars characters too. I heard that the catalogue for end 2018 were leaked. Is there someone Who know where to find them? Edit: Lego will show the summer 2018 wave at the Nuremberg Toy Fair, but photos are not allowed. So we get better descriptions of the sets. And Maybe the prices. I'll definitely be picking up Han for brown parts and that awesome collar guard. The rest of the figures don't really interest me at all and are a definite pass.